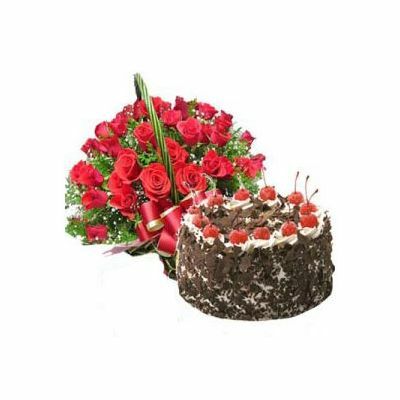 Basket of 24 Red Roses and Blackforest Delicious Cake with your loved ones.The fresh flowers and the delicious cake will surely make anyone’s day special. Our Premium Combo is ideal for any occasion and makes an ordinary day special. 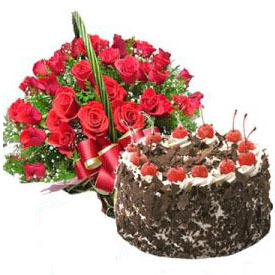 Send roses bouquet online and let our fresh blooming flowers convey your warm feelings. For Message on the Card please specify a noted in “Gift Message Box ” in Step 2 during the checkout. For Early morning delivery, place the order by 6 PM on previous day. For Same Day midnight delivery, place the order by 6 PM. The image displayed is indicative in nature. Actual product may vary in Flowers and design as per the availability.